Kusadasi is one of the most swollen holiday resort towns on the southern Aegean Coast, overflowing with shiploads of tourists in summer who enlarge the year-round population several times over. Once a small fishing village, today the busy town is packed with curios and carpet shops; its proximity to the ruins of Ephesus making it an ideal base for Aegean cruise ships. Despite the frenzied influx of holidaymakers, Kusadasi is situated amid splendid coastal scenery and several significant archaeological sites, including the three well-preserved Ionian settlements of Miletus, Priene, and Didyma. There are plenty of good hotels and restaurants, and ferries link it with the nearby Greek islands of Samos and Mykonos. The Grand Bazaar in Kusadasi, near the harbour, is one of Turkey's largest shopping treasure troves for holidaymakers to rummage through, crammed with 1,000 or more stores and stalls open seven days a week from 9am until midnight. Bargaining for a variety of attractive items, like leather jackets, sandals, carpets and hand-made jewellery, is a fun experience, usually accompanied by a glass of tea. Despite the traditional trading atmosphere, most merchants accept credit cards, travellers cheques, and even some foreign currency for purchases. Be prepared to bargain your way to a good price, however. All holidaymakers' budgets and tastes are amply catered for among Kusadasi's dozens of restaurants, cafes, and lokantas (local bars). Most visitors opt for sampling Turkish cuisine or enjoying the sumptuous seafood on offer, but there are numerous alternatives which range from curry and Chinese to burgers. For top class Turkish specialities the Konyali Restaurant, opposite the marina, and the Erzincan, near the post office, are hard to beat, while the Avlu Restaurant and Cafe is also decent and well-priced. Kalyon is popular with expats for their western menu which includes full English breakfasts. Nights in Kusadasi throb with action, particularly along the town's pulsating Bar Street in the old town centre, lined with pubs and clubs. One of the hottest spots is the huge open air disco, Ecstasy Bar, featuring top European DJs. Jimmy's Irish Bar at the start of Bar Street is a favourite gathering place for young British holidaymakers. Those looking for something more sedate will find cabaret bars, Turkish folk taverns, or cosy jazz clubs tucked away. Kusadasi's clean, sandy beaches are a major drawcard for holidaymakers, whether simply for sunbathing and swimming, or for indulging in a myriad of watersports that are on offer through local operators at the numerous 'beach clubs'. The turquoise Aegean waters are particularly popular for scuba diving and snorkelling. A variety of boat trips are also available. Water-babies will also enjoy Kusadasi's three thrilling aqua-parks, Aquafantasy, Adaland and Longbeach Aquaresort. Away from the water active holiday-makers can indulge in a horse-back safari, or head off on a jeep safari to get down and dirty on muddy nature trails in nearby Dilek Peninsula National Park. 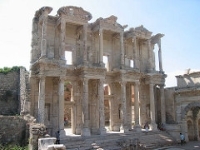 The surrounding region of Anatolia is crammed with interesting historical and archaeological sites and dozens of excursions are available for visitors to explore these, particularly the ruins of ancient Ephesus. Kusadasi's beaches become extremely crowded during the height of the summer season. Touts outside restaurants and bars can be annoying.